SJ: There are many things that I admire about your music, but let’s start at the beginning…I am willing to bet that you’ve been a musician for a long time, correct? Where did you grow up; how/when did you get started playing music and when did you start writing your own tunes? Do you write both instrumental and vocal tunes? MB: First of all, thanks, Rob, for including me in your series; I really enjoy all that your website has to offer. Ok, I grew up in Peabody, Massachusetts, about 20 miles north of Boston, in the 60’s and 70’s. Both of my parents were music teachers and pianists, so you are right about being a musician for a long time. I played cornet and bass clarinet in the school bands and didn’t really enjoy playing until one day when I was twelve, my Dad brought home a bass guitar. I was hooked immediately. I started copying tunes off of records and really developed my ear quickly. A year later Dad brought home an acoustic guitar, so I started in on that. I listened to and learned everything that I heard, and that was a wide variety of music, between my parents and my older sisters and all the great stuff that was on AM radio at the time. I played bass and occasionally guitar in bands throughout my teens until I started playing bass in my Dad’s piano trio when I was seventeen. This is when my musicianship really grew. We played a lot of standards and dance tunes and there were always requests that I never heard before. So, Dad explained to me that rather than looking at a major scale as C D E F G etc, look at it as 1, 2, 3, 4, 5, etc with half steps between 3&4 and 7&1 and all the other intervals as whole steps. This way he could call out to me “Key of C; 1, 6, 2, 5” and I would know he meant C, Am, Dm, G7. It made total sense and it opened up the fingerboard for me. I’ll skip ahead to the writing: one day when I was around twenty-two, as I was driving somewhere, I singing the ideas that were playing in my head. I thought “Duh, I should make these into a song!” So I ordered a Tascam 244 Portastudio 4-Track recorder and started writing progressive guitar instrumentals and lousy vocal pop tunes that sound like the 80’s era. In the late 80’s/early 90’s, the instrumentals I wrote were very Dixie Dregs and then Joe Satriani influenced. After that I went through my bebop jazz period and wrote jazz/funk/fusion tunes. I am planning on writing vocal tunes again in the future. SJ: I did a gig one time with a songwriter that I did not know very well (we did not rehearse prior to the gig) Long story short, it was a terribly boring gig! About the 3rd song into the gig it dawned on me – his songs were (more or less) completely driven by lyrics and rhythm, but little/no melody! He kept motioning to me to play solos but there was no melody line demanding the chords he was playing and that made it really tedious to improvise over the changes. O.k. that’s a long sidebar, but I think it’s important to my next question: How do you manage to write such great melody lines in your music? Where do you get your inspiration and ideas from as a writer? Who do you admire in this regard? And…is writing music hard work for you? MB: Ah, the melody! My earliest memories of great melodies were listening to the Beatles when I was four years old. Those songs grabbed me and I realized what set them apart were the endless supply of great melodies. I have always been moved by great melodies and chord changes and it’s what I really want to hear in music, most of the time. I love great playing, bluesiness, and funkiness, but the melody, chord changes, counterpoint, and a great arrangement are what can bring me to tears. My Dad was really brilliant in his arrangements; he had a knack for great melodies and counterpoint. Even when he played the simplest melody he would have something great moving around under it—there would always be something interesting going on. He taught Traditional Counterpoint at Berklee College during the early 60’s and played a lot of Bach and Chopin on piano, so his generous use of melody and counterpoint has been my biggest influence. I see soloing as putting together little melodies. To me, the best soloists are the ones who play over changes and you can hear the chord changes in their playing. First it was Duane Allman and Dicky Betts whose melodic playing captured me. Then Dad and his bass player when I was growing up, a fellow named Dennis Lantry; they always played with a great sense of adventure and that helped form my playing. Then, the big one: Charlie Parker—the master improviser and melody creator. Transcribing and learning his solos really opened up my sense of melody. No matter what instrument I play, whether it’s dobro, mando, guitar, or bass, some Charlie Parker influence shows in my playing. Two of my favorite improvisers now are Bela Fleck and Chris Thile. They always have something musically interesting to say. SJ: Your melody lines as so good, so distinct, that I can’t tell what instrument they were written on…What is your approach/philosophy of creativity? Do you write music with a specific instrument in your hands? Does it make a difference which instrument you write with? MB: Each instrument can inspire different ideas for a tune. It may give me a starting point of a song then most of the ideas come about when I am just thinking about the song while driving or mowing the lawn or something. I’ll mull about an idea and then try it on an instrument to see if it works. Then I may try a certain arrangement on guitar because of its wider range, to see if particular notes work together. SJ: What advice/insights can you share with someone who is interested in writing their own music on the dobro? For example does the tuning have a big effect on how you approach writing/composing music on the dobro? Any other tips? MB: I don’t necessarily write that much on the dobro, or for the dobro, really—if I do, it may be part of a song or a basic theme of a tune. I mostly use the dobro as a melody line that will stand out in a tune. I love its flexibility of pitch: the sliding, legato sound. I haven’t written a solo dobro tune like Jerry’s “New Day Medley” or “Peador O’Donnell”. I have started songs like that but most of the time I want to hear more lines or harmonies going on. The instrument has its practical limitations: playing with a bar is like playing with only one finger and you can’t really play an open string or lower fret if it’s in the middle of your bar. So it may start out as a solo tune but it ends up with other instruments. I really prefer ensemble playing over solo instruments; I love the interplay, counterpoint, and freedom one has when he doesn’t have to provide his own accompaniment. I love the way instruments blend and make another sound. I enjoy hearing players inspired by the people they play with. SJ: Apparently you play just about any/every string instrument. Which was your first; how many do you play; do you consider one to be your primary instrument? MB: I started on bass, then guitar. I learned tenor banjo in 1979 when I was playing some Dixieland tunes in a band. This helped out years later when I started to learn mandolin because they are both tuned in 5ths. I play some 5-string banjo—I’d like to eventually get competent on that because I’ve always been intrigued by the rapid-fire banjo picking. Before I started playing dobro I played some lap steel in the C6 tuning; I really love the Western swing stuff on that. I play some Appalachian dulcimer–that’s a great soothing sound– my wife loves that. Although bass and guitar are my most comfortable instruments, my focus now is on dobro, then mando. I eventually want to play fiddle. That will take a big commitment because beginning fiddle sure isn’t pretty. There’s not enough time for that now. SJ: What process do you use to record multiple instruments and wind up sounding like a complete band? Which instrument do you record first and how do you layer sounds without sounding like they were overdubbed? MB: Home recording, for me, is a pretty involved and painstaking process. First, I start with usually a guide acoustic guitar track and a click track. If the main instrument is dobro, I’ll put down a reference melody track with some reference solo tracks to kind of get the idea where it’s going. Then I add the bass, details, and other instruments. It’s a gradual thing where I’ll try different ideas, listen back to it, go out and think about it, lose sleep at bedtime because it’s still playing in my head. It takes a long time to get a tune done because I don’t have other guys around to get input from. SJ: Let’s get the lowdown on your equipment for all those interested: tell us about your instruments and recording gear. Is there anything that you have learned along the way that you would like to pass on to someone just getting started? 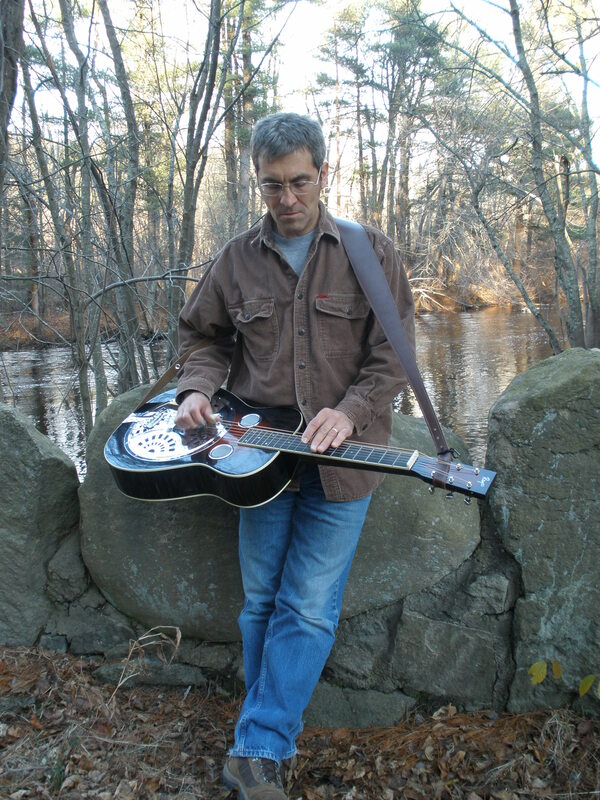 MB: My dobro and mandolin are both built by Stephen Pierce of Lowell, MA, as is the loaner banjo that is on some of my tunes. Steve’s a nice guy who builds great quality yet affordable instruments and his service is fantastic. My recording gear is pretty basic: a condenser mic into a Presonus Bluetube preamp, to FMR Audio RNC compressor, into the LINE IN of the Creative Soundblaster soundcard that came with the PC. The mics are Oktava MK-319 and MC-012, and a Rode NT1. The software is Cakewalk Home Studio 2002. The essential elements to getting a decent sounding recording is the condenser mic and preamp. The condenser is very sensitive and full range and is great for recording acoustic instruments. Dynamic mics like the SM57 won’t pick up the nuances of an acoustic instrument so save those for live performance. SJ: How did you get interested in playing dobro? Where do you draw your musicial heritage from as a dobro guy? MB: During the late 90’s I was playing a lot of blues and some jazz but I was still looking for something else. It wasn’t satisfying. One day, an engineer I worked with brought in the CD “Songs From The Mountain” with Tim O’Brien. The natural sounds of the old time music really grabbed me. I started seeking out more of this stuff and decided to pick up a mandolin. I went into a music store to look for a mandolin and there was a Dean squareneck reso on the wall. After playing it there for a while I decided I had to have it. This was January of 2001. I don’t remember what the first songs I learned were but I set out to learn the fingerboard and how I could apply what I knew on guitar to this new instrument. I was aware of Jerry Douglas because of years of reading guitar player magazine so I sought out recordings he was on. After hearing discs such as Strength In Numbers, Bela Fleck’s Drive, and Chris Thile’s Not All Who Wander Are Lost, I found that here is a music that is based on tradition but unlimited in its creativity. I thought “Aha! This is right up my alley!” I recently rerecorded a few of my tunes were written 10-15 years ago when I was playing electric shred/funk/jazz fusion. They seem to sit better, to my ear, with the acoustic instruments than with the electric—replacing the distorted wailing lead guitar with a clean singing dobro is less aggravating to my ears. The thing that I like about the bluegrass scene is that creative, adventurous playing is encouraged. With blues, you are limited by the chord changes and narrow vocabulary and if you take it too far outside, it’s not blues anymore. In blues and jazz, there was a lot of pretentiousness in these communities; in rock, image is a big factor. I’ve found that in bluegrass/newgrass, the audiences are ready for anything as long as you keep most of the traditional instrumentation. In this acoustic music, age and image are not a factor. There are kids playing along side seasoned veterans and old timers. It’s all about the music. I feel like I’ve finally found the music I want to play, on the instruments I want to play. I feel as though I’ve just begun. Plus, since my Dad passed away a few years ago, I feel more responsibility to create adventurous music and continue what he gave to me. SJ: Are you a gigging musician? Do you play with a band or as a backup musician on dobro, etc? MB: I gig a fair amount. There are a few bands that I work with regularly and occasionally. One is an acoustic duo based on an electric blues/rock/funk full band called Paws Up that I sometimes play guitar with. With the duo, I bring out the guitar, dobro, and mando. With the electric band, I bring a 50’s Supro lapsteel and dobro in addition to a Strat or Tele. There is a lot of room to stretch out with Paws Up—it’s always fun and adventurous. My brother Christopher plays drums with them so it makes it even more fun. I sometimes play bass with a great cover band called Roundabout—they are primarily a vocal band. I would like to get in a semi-regular bluegrass situation. I have a lot of great New England bluegrass pals that I jam with; they are more traditional, so I always learn from them. There was a time in the late 80’s when I played music fulltime and I had some professional success as a bass player. I became discouraged with the music business and how it was all about packaging and presentation and image—it was all so fake. I went back to school and got a degree in electronics and now work a fulltime job as a manufacturing engineer. I enjoy music much more now that I don’t make my living from it and can be selective as to what I play. SJ: Do you have a CD available? How can someone preview or purchase your music? MB: I don’t have a CD available at the moment. I am looking at recording one over the next year—it’ll take me that long to put it together. I have a page at http://songramp.com/beanbass where I upload my tunes for the public to hear. I also upload them occasionally at http://www.reso-nation.org in the sound bites section. Look for “beanbass” as the author. SJ: Are there any closing comments or insights that you would like to share with our audience? G to B = maj 3rd, B to D = min 3rd, D to G = 4th. Learn the major scale as numbers and steps: half step at 3 & 4 and 7 & 8; all others are whole steps. Do it on one string and then cross over to neighboring strings at random points. This can be transposed to any key. See how the minor scale is different from the major (minor = flat 3, 6, 7). Always be aware of what scale number you are on; be aware of where your root is in relation to where you are at the moment. Know that 1-3-5 of the scale make up the root chord of your key; the IV chord is made from the 4-6-1 of your scale and the V chord is made up of 5-7-2 of the scale. See this in all positions up the neck. I feel that this is the road map to being able to use the whole neck. Learn it to the point where you don’t have to think about it. This is applicable to any instrument. Once you see how it’s put together, the rest is just playing, and that’s when it becomes fun. Thanks again for having me, Rob. I think this is the golden age of resophonic guitar and I appreciate all you are doing for the reso community.